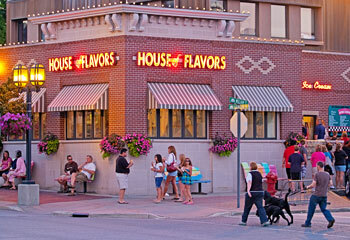 Just blocks from the beach is the heart of downtown Ludington, where you can shop, dine, and enjoy summertime events. Several downtown businesses have late night shopping hours on Fridays & Saturdays during the summer months; shop til 9pm! Every town has their specialty shops, and Ludington is no different. Unique items can be found in various stores, as well as clothing that features the "Ludington" name. Jewelry, gift shops, photo galleries, and consignment shops are just a sampling of the businesses that are eager to serve you. You'll enjoy the personal, friendly service that Ludington area shopkeepers are known for. There's parking in front, or use the large lots behind the businesses on the north side of Ludington Avenue. Shopping can make one hungry, so take a break from the heat and pop into a downtown Ludington restaurant. Homestyle cooking, bistros, ice cream, Italian, sports bars...whatever your preference, you'll find just the place for breakfast, lunch, or dinner. Head down south James Street for even more restaurants. North James Street Plaza is closed to traffic, and has tables set up for eating alfresco. Outdoor dining is also available in front of several downtown restaurants during the summer months. Take a look at the menus of Ludington restaurants in our Lakeshore Menu Guide. 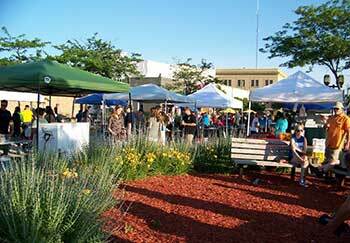 From May-October, James Street Plaza is the venue for the Ludington Farmer's Market, open Fridays from 3-8pm. Purchase some produce fresh from local farms, or pick up some baked goods, jewelry, or handmade craft items. Friday Night Live takes place in late July and early August, where the three blocks of downtown are closed to traffic. Food vendors, music, kid's games and entertainment make this event very popular with visitors and residents alike. Other festivals that take place downtown throughout the year are the July 4th Freedom Festival, Oktoberfest, and the New Year's Eve Lighted Ball Drop. Need a bit of culture in your life? The Ludington Area Center for the Arts is located just off Ludington Avenue on South Harrison Street, and is the venue for concerts, writer's forums and theater productions. Ludington has a collection of unique sculptures you won't want to miss. Check out our Mason County Sculpture Trail story to find out where they are located. 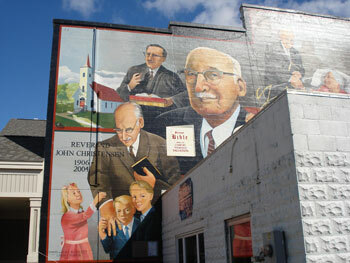 There are also painted murals on the facades of nine downtown businesses, making for an interesting walking tour. Ludington is home to many galleries featuring the talents of local artists including photographers, painters, potters, jewelers, crafters and more. See local art galleries here. 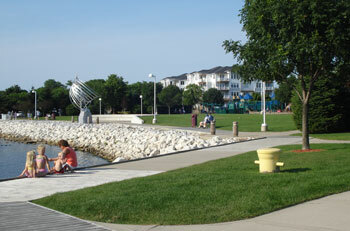 Three parks are within walking distance of the downtown area. Waterfront Park is nestled between our two marinas, and features a modern playground, sculptures, tables, and amphitheater. Rotary Park (formerly called Ludington City Park) is located between the beach and downtown, and is the home of the Arts & Crafts Fairs held twice during the summer....plus Movies in the Park, every Thursday night in August. Stearns Park is at the west end of Ludington Avenue, and features an expansive beach, concessions, grassy area with grills and tables, mini golf, shuffleboard, playground, and skate park. It's all nicely compacted within a few blocks. 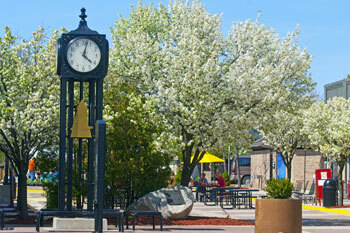 So come spend some time with the friendly folks in downtown Ludington. You'll leave with a satisfied appetite, a new treasure, and a smile.